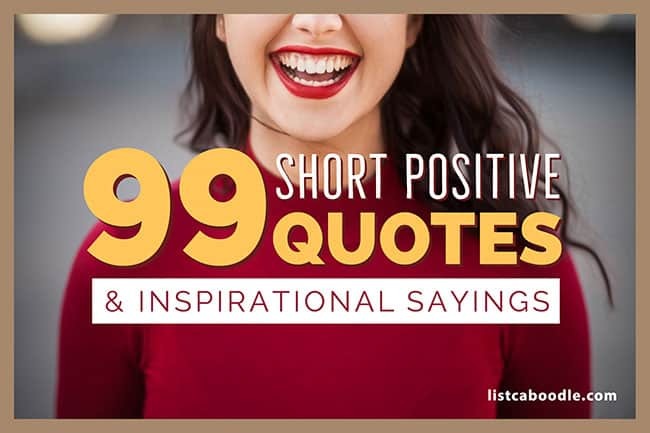 When you need a little boost of inspiration, check out this collection of quotations to lift your spirits. Looking for short positive quotes for business, life and relationships? We’ve put together a list of some of the best quotations to motivate and inspire you. Take a few minutes to read all of the short uplifting quotes and try to both understand its meaning and apply the lesson to your own life. Think, reflect and act. As you read through each insight on this page, please take some extra time to think about what message the author is trying to communicate. You may choose to review only a handful of quotes at a time to think about and analyze the meaning behind the words. Or you may decide to read through all of the offerings and identify the quotations that you find deeply meaningful. Perhaps one really hits home. It resonates. Whichever path you pursue, don’t hesitate to come back to this page of short positive quotes over time for additional inspiration. Believe in the you who believes in yourself. If you’re not willing to be a fool, then you can’t be a master. Looking for humorous quotes? Check out these short funny quotations. You can tell a pioneer by the arrows in his back. Life does not owe you anything because life has already given you everything. It’s better to be a warrior in a garden than a gardener in a war. Just do your best and to hell the rest. Note: If you have any short positive quotes you’d like to recommend, please let us know. Thanks. Every man’s responsibility is his own responsibility. Tip: These short positive quotes make great photo captions or email closers. Nobody else can live the life you live. It can be hardest of all to forgive people we love. It always helps to have people we love beside us when we have to do difficult things in life. In a way, you’ve already won in this world because you’re the only one who can be you. Solitude is different from loneliness, and it doesn’t have to be a lonely kind of thing. ‘We’ll be Friends Forever, won’t we, Pooh?’ asked Piglet. ‘Even longer,’ Pooh answered. You’ve been reading Short Positive Quotes & Inspirational Sayings.